After failed last-minute talk with Lapid, PM gives Yesh Atid and Hatnua chairpersons the boot spelling imminent elections. Prime Minister Binyamin Netanyahu on Tuesday made the dramatic move of firing Finance Minister and Yesh Atid Chairman Yair Lapid, as well as Justice Minister and Hatnua Chairwoman Tzipi Livni, spelling the end of the coalition government. The move comes on the heels of a failed meeting between Netanyahu and Lapid on Monday night, in which the two were unable to salvage the coalition that has been rocked by numerous tensions, prime among them in recent weeks the Jewish State Law that would enshrine Israel's status as the nation-state of the Jewish people. Netanyahu gave the order to Cabinet Secretary Avichai Mandelblit to send off letters of dismissal to the two ministers. 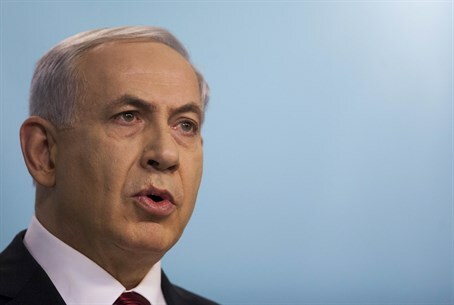 He is to give a statement about the moves at 8:10 p.m.
"In recent weeks, including the last day, the ministers Lapid and Livni have sharply attacked the government I lead," explained Netanyahu. "I will not tolerate any more opposition from within the government, I will not tolerate ministers attacking the policy of the government and its leader from within the government." Netanyahu continued, saying he had ordered to disband the Knesset "as soon as possible to go to the nation and receive a clear mandate from it to lead Israel." Earlier on Tuesday, the Likud party decided to back bills of no confidence calling to break apart the government submitted by the opposition parties, which are to be voted on Wednesday. Regarding Netanyahu's complaints of attacks from Lapid and Livni, two months ago the two declared a leftist front, and Lapid shortly afterwards reportedly threatened to form an alternate coalition. The prime minister's leadership has also come under sharp criticism from Economics Minister and Jewish Home chairman Naftali Bennett, who also serves as Jerusalem Affairs Minister and is a key member of the coalition. He recently said in light of the crumbling security and rising Arab terrorism in Jerusalem that his own government "has no right to exist."